Here’s a prize that’s really worth seeking! 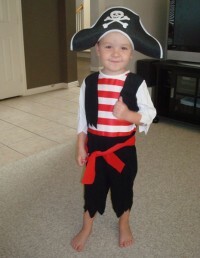 These days my four-year-old grandson, Aidan is seriously, and I mean seriously into pirates. Eye patches, daggers, sword fights, and shouts of "Shiver me timbers” and (as he says it) "Walk the pwank!” are all the rage with him. And because I’m seriously into Aidan, when I am with him, those things are all the rage with me too. Last week I spent four days at his house, which gave me the perfect opportunity not only to bake a rather pitiful-looking pirate cake together, but also to create a treasure map for him. Here’s what I did: First I soaked a piece of paper in leftover coffee and set it out to dry overnight. By the next morning it looked just like aged parchment, complete with curled edges. Next, on the map itself I drew an ocean to give us our starting point. Soon afterward Aidan and I "discovered” the map rolled up and stuck into a bottle, floating in the ocean (okay, so the ocean was just a bucket of water on the front porch. Come on! Use your four-year-old imagination here!) Anyway, with Aidan attired in full pirate gear we followed the dotted lines on the map that took us over a crocodile pit filled with stuffed animals, through a cave made of sofa cushions, up the "slippery rock” staircase, to the top of "Skull Mountain” (his top bunk). After pausing for some graham cracker hardtack and apple juice ale, we finally ended up in the back yard where an "X” marked the spot in the flowerbed. Sure enough our digging efforts were rewarded with a buried shoe box – oops, I mean treasure chest – that was filled with priceless jewels and doubloons (any resemblance to last spring’s plastic Easter eggs is purely coincidental.) Needless to say, it was a big hit with the little Buccaneer and his First Mate, Avery Kate. In fact, I think he must have re-buried and re-hunted that same treasure at least six more times over the next two days. The whole time we were following the map all over the house I marveled at how Aidan’s eyes sparkled with anticipation. He could hardly wait to see where it would take us next. What’s more, I’m fully convinced that there could have been a dozen more obstacles to overcome along the way and he’d gladly have met the challenge. Why? Because he knew there was something special waiting for him at the end of the journey. Not surprisingly, Aidan and his pirate map came to mind earlier today when I happened upon this verse in my Bible: "The kingdom of heaven is like treasure hidden in a field. When a man found it, he hid it again, and then in his joy went and sold all he had and bought that field.” (Matthew 13:44) I wonder… Do you suppose the man just stumbled upon that treasure by accident, or did he actually go looking for it? Either way, the point is that the treasure wasn’t right there in plain sight. It was hidden. And according to the parable, the same is true about the kingdom of heaven, which means that in order to discover the blessings that God has in store for me; I’m going to have to search for them. But how do I go about it? I mean, it’s not as if I have a treasure map to go by… Or do I? Remarkable as it may seem, the Bible I hold in my hands is actually the greatest treasure map anyone could ever ask for, and all I have to do is open it up and follow where it leads. Sure, there are perils to watch out for along the way – deep pits of temptation, slippery rocks leading to old habits, dark scary caves of doubt and despair – but the pathways to avoid those things are clearly marked, if I’m smart enough to take them. Meanwhile, countless riches – like peace, comfort, mercy, grace, joy, and forgiveness – are hidden everywhere, just waiting to be discovered! You know, it’s been a really long time since there was a sparkle of anticipation in my eyes, or an Aidan-like sense of excitement over where God is going to take me next. But thar’s a kingdom of heaven buried somewhere in that field – I can feel it in me bones. Would ye care to come along on the adventure with me? Then shiver me timbers, Mate – gather up ye map, grab ye shovel and let’s start digging! Arrrrgh! Search for Childlike Wisdom articles similar to "Hidden Treasure!. Search all articles similar to "Hidden Treasure!". List all Childlike Wisdom articles.